It may not be a surprise to you that there are a number of mobile bidding companies in the market, a few of which we run into regularly when competing for business. We find competition to be good both for customers and for us (it keeps us sharp!) However, competition can also be tough, especially if it generates inaccurate or incomplete information. But, recent conversations with prospective Handbid customers has shed light on the fact that some things are being said about Handbid that are not accurate. It is not important who is saying this, and it does not offend us, but we want to make sure our clients and prospects get accurate information before making important decisions about their fundraising partners. This week, we will cover two of the five. Our first auction was held in May 2011 here in Denver and our 2nd auction was two weeks later in Los Angeles, CA at the Natural History Museum. 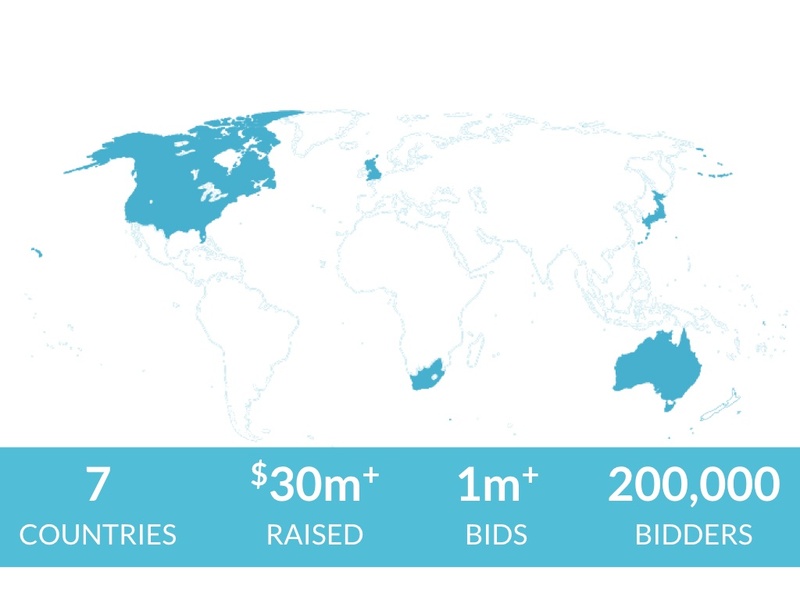 While primarily based in the United States, Handbid has run auctions in seven different countries (United States, Canada, Australia, Hong Kong, Tokyo, United Kingdom and South Africa) supporting transactions in 7 different currencies. Over this time period, we have raised more than $30 million for charities, processed more than a million bids, and serviced more than 200,000 bidders. In 2016 alone, we ran more than 600 auctions, processed 267,000 bids, and had nearly 200,000 app sessions (in our app). We continue to nearly double in size year over year and are grateful for our growth and the many hundreds of customers who have trusted us with their auctions. We celebrate every new customer who joins our family daily. Have questions about our auction experience or our infrastructure? Feel free to reach out to us and we can answer any questions you have! While the vast majority of our customers run auctions without our staff present, we do offer this service. Most clients opt for a Handbid auction expert, a highly experienced auction manager who can organize and direct a team of staff or volunteers to run a successful auction. We also offer onSite staff who can work with organizations to do checkin, technical support, help bidders, record live auction and paddle raise donations, and checkout. While we love attending events, we also want to be sensitive to budget and know that staff is the largest portion of the cost when hiring a mobile bidding company. So we push our clients hard to hire fewer but more experienced staff and supplement them with volunteers wherever possible. One thing we make sure is that the staff we bring to an event are trained, experienced and capable. For auction managers we offer free self-paced training in our Handbid Knowledge Base, and a number of e-Books which are downloadable free of charge at Handbid University. In addition, we have some clients who want customized or 1:1 training which we offer for an additional fee. Most of our clients are able to learn the system using our Knowledge Base and getting questions answered via email and phone. However, those who sign up for our 1:1 training love the attention and customization we provide to kick start their event. Often in a one-hour session, we will have your auction setup and you will be well on your way to fully understanding the capabilities of executing a successful Handbid Auction. That is all we intend to cover in this installment. In the next post, we will cover two other things we want you to know about Handbid before making a decision! If you have any questions about these services, please feel free to reach out to us.